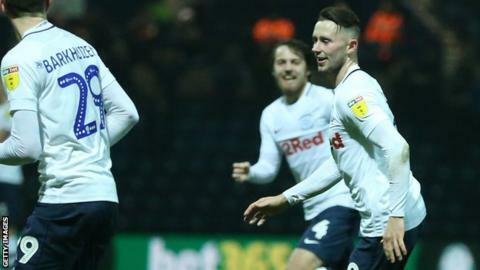 Middlesbrough dropped out of the Championship automatic promotion places as Preston stretched their unbeaten run to nine games in an entertaining draw. Alan Browne deservedly fired Preston ahead on the stroke of half-time with a low strike from Brandon Barker's cross. But a tactical and personnel switch by Boro manager Tony Pulis produced immediate results after the interval as substitute Marcus Tavernier slotted in an equaliser from Dael Fry's through ball. Both sides came close to a winner as they saw efforts cleared off the goal line, but the point was enough for Boro to extend their unbeaten league run to seven matches. Preston move up a place to 15th and have not tasted a Championship defeat since the end of September. Boro slip a place to third after Leeds overtook them with a narrow win against Reading. Browne put Preston into the lead with his sixth goal of the season. He was found in space by Barker, who himself was denied a goal in the opening minute when Lewis Wing made a sliding tackle in the penalty area. Boro lost Rudy Gestede to a first-half hamstring injury and then Wing to a knock to the face in the second half, which forced Pulis to make all three of his substitutions by 48 minutes. One of them was Tavernier, whose second goal this campaign was well-taken as Preston keeper Declan Rudd tried to deny him from 10 yards out. "To play as well as we did tonight against second in the league, with six first team players missing, any team would struggle to do that if you take those players out of your squad. "We haven't got any players left really, we had young Jack Baxter in the squad today doing the warm up because we are really stretched in terms of fit players we have available. "It was a great goal. Alan (Browne) got dropped out at Bristol because I felt he was showing signs of fatigue, mentally more than anything. In the last two games he's shown why he is a player I rely on and I trust. "The (Middlesbrough) goal is disappointing because it's a bad error from us and I don't think they created too much apart from that. "We are playing well at the moment and we just want to keep that going now." "We take a point, and we've taken four points from two away games at Brentford and Preston, who are the form team at the moment, especially at home. "It's always difficult going to Brentford. Four points, it's not too bad. "It's the second one on the bounce, and it's the second one where we have to travel and bed the lads down again and we didn't get much time. "I'm really pleased again with the effort, but there's certain things we didn't do that we did the other Saturday, but having said that I still think we deserved what we got." Match ends, Preston North End 1, Middlesbrough 1. Second Half ends, Preston North End 1, Middlesbrough 1. Jordan Hugill (Middlesbrough) is shown the yellow card. Jordan Hugill (Middlesbrough) has gone down, but that's a dive. Danny Batth (Middlesbrough) wins a free kick in the defensive half. Attempt missed. Brandon Barker (Preston North End) right footed shot from outside the box is too high. Assisted by Paul Gallagher following a set piece situation. Joshua Earl (Preston North End) wins a free kick in the attacking half. Attempt missed. Jordan Storey (Preston North End) right footed shot from a difficult angle on the right is too high. Marcus Tavernier (Middlesbrough) is shown the yellow card. Marcus Tavernier (Middlesbrough) has gone down, but that's a dive. Corner, Preston North End. Conceded by Martin Braithwaite. Attempt missed. Tom Barkhuizen (Preston North End) header from the centre of the box misses to the right. Assisted by Brandon Barker with a cross. Corner, Preston North End. Conceded by Danny Batth. Attempt blocked. Brandon Barker (Preston North End) left footed shot from the left side of the box is blocked. Assisted by Tom Barkhuizen. Attempt missed. Danny Batth (Middlesbrough) header from the left side of the box misses to the left. Assisted by Dael Fry following a set piece situation.